With a 425-horsepower, 6.1-liter HEMI engine up front and 71.6 cu. 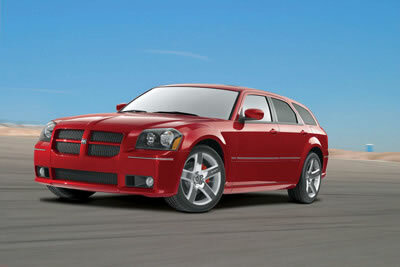 ft. of cargo space in the rear, Magnum SRT8 hauls in more ways than one. Street and Racing Technology (SRT) engineers began with a solid foundation and successfully injected SRT DNA in order to produce a vehicle that can cover a quarter-mile in the mid-13-second range and haul home a brand new 27-inch TV. The new 6.1-liter SRT version of the legendary HEMI engine was inspired by the original family of HEMI engines, particularly the namesake hemispherical combustion chambers that provide power and efficiency and select visual cues including the classic orange-painted cylinder block and black valve covers.